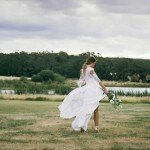 Oh, my word this bridal gown collection from Needle & Thread is utterly romantic! Featuring dreamy floral embellishments, exquisite beadwork and romantic tulle, these stylish wedding dresses are perfect for any type of wedding. The Needle & Thread Spring/Summer 17 bridal collection embraces beautifully embellished ready-to-wear dresses and separates. The 11-piece range embraces a contemporary fluidity through soft structures, embellished clusters of delicate beadwork, uttering sophistication and elegance for every bride. Floral motifs adorn youthful coordinating separates in lighter-than-air tulle, for a laid-back destination appeal. The Trailing Tiered Gown brings a contemporary twist for the modern bride, with soft pink degrade tulle, whilst pink roses inspire the beautifully embroidered Rosette Gown and Top. The Astral collection, adorned with a delicate floral trailing motif of silver cut beads and sequins offers an exquisite shimmering effect, available in a gown, maxi dress, cape and a traditional saree, a nod to our Indian design heritage. The line exhibits classic and contemporary bridal wear, to create blissfully romantic memories. The Spring/Summer 17 collection by Needle & Thread Bridal is available now at needleandthread.com, from £120 to £1150.